This week’s pick is Evernote – and it’s a long overdue pick. My first ever pick for this series was a sort of Evernote child app – Evernote Peek. Evernote itself has been a favorite of mine since the earliest days of the App Store, and it’s still a go-to app for me on the iPad, MacBook Pro, and iPhone. 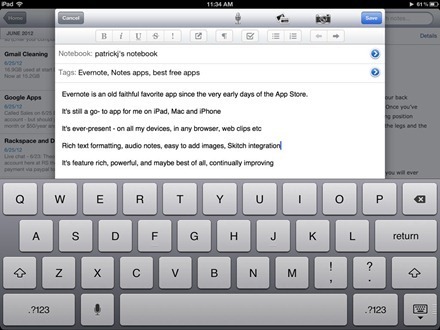 As its name might suggest, one of the nicest things about Evernote is that it’s nearly ever-present. It’s available on the iPad, the iPhone, Mac and Windows PCs, and in most mainstream browsers. It has web clipping tools to make it easy to throw interesting things you spot on the web straight into an Evernote note. It’s also such a popular and well-respected app by now that numerous other apps now have hooks into it – so their content can be easily shared to Evernote too. It now offers rich text formatting in the iPad app – so you can format text as bold, italic, underlined, strikethrough and in bulleted and numbered lists. You can even add checkboxes when you’re creating an action list in a note. It lets you do audio notes and notes from photos – and has impressive OCR like features that allow you to search for words not only in text, but also in images. This is one of the most versatile, feature-rich, and powerful notes apps for iPad, iOS and PC – and, maybe best of all, it is continually improving. It’s one of the most frequently updated apps I know – and the updates are nearly always significant and packing impressive new features. It’s also a killer storage app for information that’s important to me. Evernote is an app I recommend to just about every new iPad user and every friend or acquaintance who I talk to about the iPad. It’s always at or near the top of the recommended apps list in these conversations. 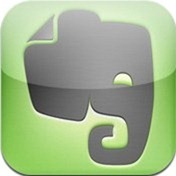 Here’s an App Store link for Evernote. I have to agree, I love Evernote. I’ve had it numerous handsets and on my iPad and it has become a staple of my daily life. Can’t recommend it more. You never actually say what the app does.